Essential for the health of the mind and body of a human being is his subtle energy system. The founder of homeopathy Samuel Hahnemann called it two hundred years ago the „vital force“, in Indian traditional healing it is called „prana” and in China it is called „chi“. When we speak about energy, it is of course nothing in a physical meaning of the word. It is something „spiritual” as Hahnemann says, or of „fine-matter”, as the Buddhists say. It is a kind of flow of information, which connects us with higher levels of being and on the material level creates our life energy, organises us and gives us harmony and feelings of happiness, as long as it functions well. But when it is disturbed, the harmony and happiness disappear and illnesses arrive. Of course, this model cannot be accepted in a materialistically-oriented health care system, however, its disregard has a share on the unprecedented increase of chronic, „incurable” health problems in today’s society. Ancient human wisdom always offered instruments by means of which the disrupted flow of prana could be improved and harmonized. Some of these methods such as acupuncture, homeopathy and yoga are generally known, however, there is also one method which has been forgotten in the course of time. 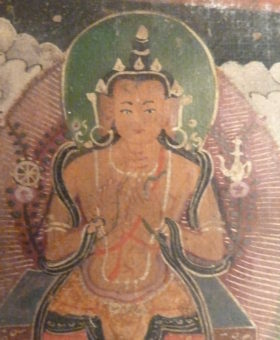 Maitreya, the future Buddha, is often pictured with a kundika to his left side. It contains clear water, which heals. A detail of an ancient pendant in Tibetan tradition. 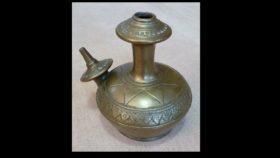 In ancient times, while travelling, the Buddhist monks carried with them enclosed in a special bag a vessel for water called kundika. The Chinese traveller I Tsing who in the 7th century AD set up for India to study there the customs and life style of monks writes about it. This earthenwear vessel was different from other vessels by its side opening, through which the water poured in at the top would freely run out. Thus it was rather a kind of flow-through instrument. In his book I Thing does not mention its purpose, nor are there any satisfactory explanations in current descriptions of museum exhibits. He only writes that the water used in the kundika had to be clean and „untouched“. In other literature it was mantioned as life-breathing vessel. Hundreds of broken kundikas were discovered by archaeologists near places where Buddhist monastries formerly stood, and this mainly on former rubbish dumps, which shows that kundika was not a ritual object of worship but rather a thing for daily use. The word kundika has an obvious origin in the word kundalini, the so called „serpent power“, which is a term known from yoga. Kundalini, similarly as prana, has a relation to subtle energies, connecting us with the Universe. Kundika was used already in pre-Buddhist India. Preserved is Kundika Upanishad from the time between 4th and 8th century AD that says that the use of kundika stimulates prana, strenghtens vitality and senses, strengthens connection with higher level of being, and brings tranquility. Buddhist deities such as Avalokiteshvara, Maitreya, Quan Yin, Tara were mostly depicetd vith kundika by their left hand. Chinese kundika from the first half of the 19th century. At that time, the vessels were still retaining their general shape however their use in ancient history was forgotten. Today, I and my pupils use a modern kundika, called autopathy bottle. We do this already for 15 years. I got this idea when Inoticed that in the past some homeopaths, starting already with Hahnemann, used a highly diluted (potentized) information from the treated person. To make the preparation they used saliva and other substances carrying bodily information of the treated person. It was called autoisopathy. In 2002, I have developed the autopathy bottle and started to use it in my homeopathic praxis. It is intended for making a potentized preparation from bodily information contained in the breath or saliva of the treated person. It functioned well, the chronic problems soon disappeared, and soon many other persons who visited the courses or have read my book about the new method started to practice autopathy. About a year later I saw the first kundika in an ancient painting of the bodhisattva Maitreya in the National Gallery and the similarity between it and my autopathy bottle has affirmed me in my view that we are only taking up something that was used for many centuries, although it is forgotten in the present time. More information about this context see in my book Get Well with Autopathy. Already the ninth year, a conference about autopathy regularly takes place in Prague. People using this old-new method take part to share findings from their practice of autopathy with others and to show their results in curing chronic illnesses. They often report about totally „impossible“ cases of healing long-lasting disorders by diluting the subtle information from breath, saliva or directly from the 7th chakra by clean water, thus elevating it to a subtle-energetic, spiritual level and so stimulating the flow of prana. Not only healers and medical practitioners take part, there are also many contributions about self-healing, about how and what people cured themselves after they had read the book Get well with autopathy or after visiting a course. Autopathy is simple and one can use it also alone without a consultant. It is based on homeopathic principles that were always known to mankind. Even when it may represent for today‘s materialistically thinking person a great mystery, it rids people of pains in the joints, migraines, sleeplessness, eczemas, allergies and so on, as well as anxieties and chronic tiredness, problems that bothered them whole decades. All these disorders of the body and mind are caused by separation from higher levels of our existence. It is enough to informatively connect both with the aid of clean water and very interesting things happen. Due to their form the ancient kundikas produced only very low information potency, suitable for people of that time who were much more connected with their subtle sphere and also ate only bio-foods and breathed only the cleanest air. To achieve the same effect today at the end of Kali Yuga, it is necessary to use very high homeopathic potencies, which can be easily prepared in the autopathy bottle. And we do not have to (when we do not want to) worry about religious concepts either. In the old religions, also advice and instructions for everyday life were always passed on. When the monk walked through malaria infested landscape, he had to protect himself. Kundika had surely helped him. And when we walk through infested landscapes of today, we can remember kundika too.